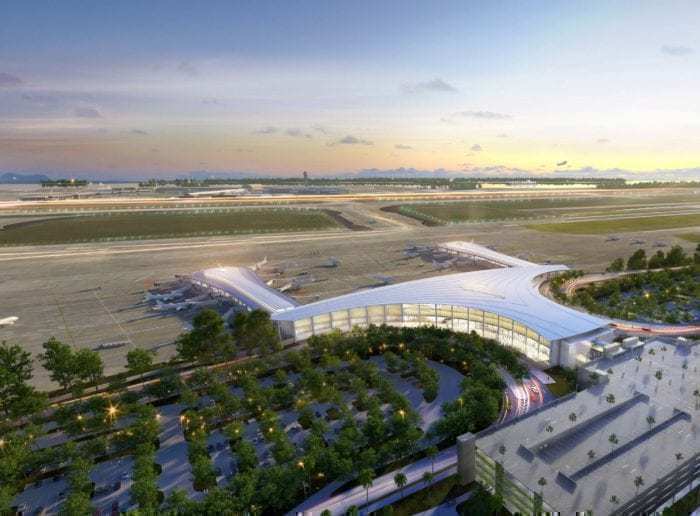 The City of New Orleans and the New Orleans Aviation Board have delayed the opening of the city’s new airport – yet again. 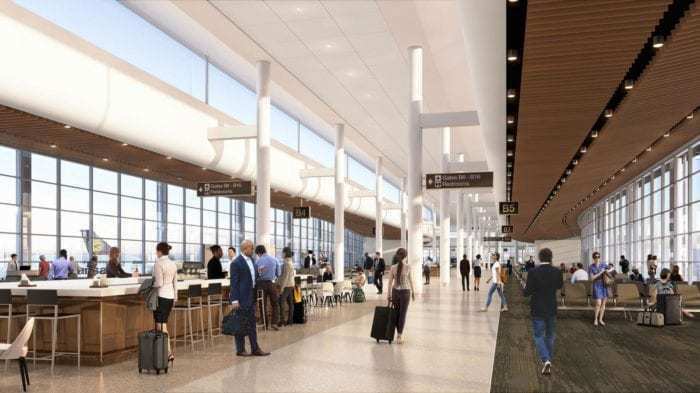 The entirely new Louis Armstrong New Orleans International Airport (MSY) is now set to open “sometime” in fall 2019. The city previously intended to begin operations at the new MSY on May 15, 2019. Artist rendering of the new New Orleans International Airport (MSY). Image by New Orleans Airport. In the spring of 2013, the New Orleans Aviation Board announced an ambitious plan to build an entirely new airport for the city of New Orleans. The project is the first brand new airport to be built in the US since Denver International Airport (DEN) opened in 1995. The new terminal boasts passenger-friendly amenities like over 40 food, beverage, and retail concessions post-security, as well as a new United Club and Delta SkyClub. Artist rendering of New Orleans (MSY) Concourse B. Image: New Orleans Airport. New Orleans’ current airport has a decentralized terminal structure with multiple security checkpoints. 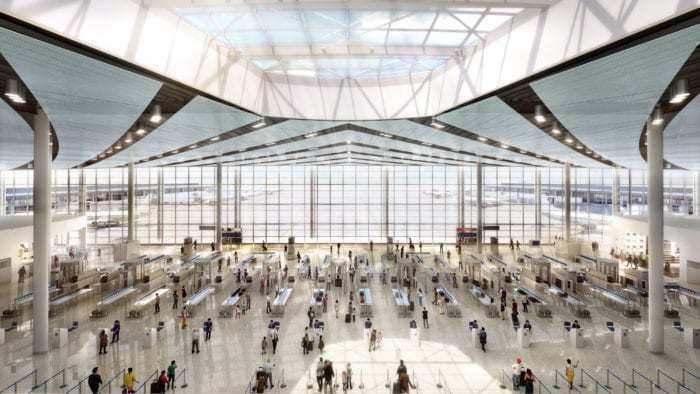 The new main terminal will have one consolidated TSA checkpoint with 17 lanes – the length of a football field! In theory, one consolidated checkpoint should allow TSA to expand (or contract) the facility as demand fluctuates. In addition to strong tourist demand, New Orleans hosts major events like the Super Bowl. A consolidated security checkpoint at the new New Orleans Airport (MSY). Image by New Orleans Airport. New Orleans (MSY) was one of the first mid-size markets British Airways launched with its smallest Dreamliner variant, the Boeing 787-8. The carrier currently flies London Heathrow (LHR) – New Orleans (MSY) five times per week, year-round. British Airways has since launched Nashville (BNA), Pittsburgh (PIT), and Charleston (CHS) in its push to serve more US destinations. New Orleans (MSY) has service to seven international destinations. Image by GCMap. Condor also flies longhaul to New Orleans (MSY) from Frankfurt (FRA), albeit only twice weekly during the busy summer season. Panamanian flag carrier Copa Airlines connects Panama City (PTY) with New Orleans (MSY) – the city’s only connection to Central America. United partner and Star Alliance member Air Canada flies twice daily to Toronto (YYZ). New Orleans also sees up to three daily flights – during peak-season weekends – to Cancun (CUN) on United, Delta, and Southwest. Vacation Express also offers weekly charter service to Punta Cana (PUJ) and Montego Bay, Jamaica (MBJ). So it’s a new terminal at the existing airport? That means it’s not entirely new. Many airports have received new terminals as they update. Can you guys wright one article without contradicting yourselves?